Santolin Wines | Santolin selected by Qantas – again! Santolin selected by Qantas – again! 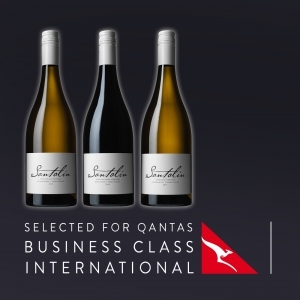 Santolin Wines have once again been selected by Qantas to feature on their International Business Class Wine Menu for a second year. This time three of our wines were chosen – the 2014 Syme on Yarra Vineyard Pinot Noir, 2015 Willowlake Vineyard Chardonnay and 2015 Yarraland Vineyard Chardonnay, to be served on selected Business Class flights. The highly regarded Qantas Rockpool Sommelier team blind tasted and reviewed thousands of Australian wines before narrowing down their selection, with the focus on wines of elegance and balance with varietal definition and regionality. We’re delighted that three of our Yarra Valley wines were selected, especially from such a large pool of contenders. With two of Australia’s most recognised brands in Qantas and Rockpool, it’s an amazing opportunity for us to showcase our hand crafted, small batch wines – and the Yarra Valley region, on an International stage. If you’re flying Qantas Business Class in the near future, keep an eye out for us!